Greed is Good – What if Gordon Gekko was a Financial Advisor? A recent LinkedIn group discussion about the use of C Share mutual funds caused me to comment that the advisor in question must have been Gordon Gekko. This made me wonder what the fictional Mr. Gekko would be like if he came to life as a financial advisor. For those of you who may not know, Gordon Gekko is the Investment Banker from the film Wall Street played by Michael Douglas who uttered the immortal phase, “Greed, for lack of a better word, is good” at the shareholder’s meeting of a company that he was attempting to take over. I’m pretty certain that Gekko would not embrace the fee-only compensation structure with its transparency and lack of revenue from the sale of financial products. Rather I suspect he would gravitate to either the commission or fee-based structures. Certainly his slicked-back hair and big cuff-links would fit the stereo type of the financial advisor as a producer model. I’m guessing that Gekko would love the high cost B Share mutual funds and would be doing everything he could to keep clients in this share class as long as he could. Overall he would likely favor share classes with some sort of sales load in order to increase his income. No low cost index fund or ETF recommendations from Mr. Gekko. Gekko would likely suggest that you buy one of the many high cost variable annuities that make him a ton of money and may have questionable results for you his client. There is nothing wrong with variable annuities; in fact they can be a viable solution for some clients. What is objectionable is the way these products are often sold and the high cost versions of these products that are generally pushed by fee-based and commissioned reps. You will never hear them touting low cost, no surrender charge versions of this product that are offered by Vanguard and others. Life insurance is a key component in the financial plans of many folks and rightly so. Life insurance can provide an easy way for a family to build an estate quickly and can help protect their lifestyle should the primary breadwinner die before accumulating a sufficient level of wealth. Inexpensive term life insurance generally provides the best approach to life insurance. I doubt that Mr. Gekko would see things this way. In order for him to realize a big payday from selling you a policy, some sort of cash value policy such as whole life, universal life, variable life, or some variation would likely fit the bill. He might try to sell you on the value of the policy as an investment or as a retirement savings vehicle. While there are instances where a cash value policy makes sense, be very skeptical if your agent or financial advisor really pushes one of these products. Make them show you a realistic illustration. I’ve actually seen policy illustrations using a 12% annual rate of return. 12%, really? Oh yes, greed is good I forgot. Whenever I’ve written a post in any way suggesting Equity Index Annuities are not the best alternative for the Baby Boomers and retirees, I receive a fair amount of negative comments that range from disagreement to questioning my knowledge of finance. This leads me to believe that my comments are right on the money. Mr. Gekko would especially love the fear-mongering approach that is often used to sell EIAs after a market downturn. Given the popularity of these products among the financial sales crowd I have to assume the payouts are generous, making this product a natural fit for Mr. Gekko. If Gekko offered 401(k) plans as part of his practice he’d likely love the high cost group annuity plans offered by many insurance companies. The worst event from his point of view is the recent 401(k) disclosures mandated by the government. I wonder if Gekko would even be able to spell the word Fiduciary. Greed is good as long as greed it is pursued in an ethical fashion and on behalf of an advisor’s clients. I’m also not saying that every advisor who is paid all or in part via commissions from the sale of financial products is a bad advisor. 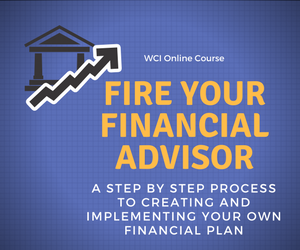 Clearly, however, the fee-only model starts with fewer potential conflicts of interest for the advisor. 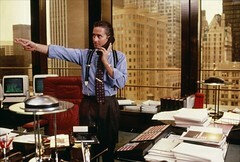 Gordon Gekko is one of the best movie characters of all-time in my opinion. Let’s be glad that he is just a fictional character and not a practicing financial advisor. Please feel free to contact me with your questions. Please check out our Resources page for more tools and services that you might find useful. How is My Financial Advisor Compensated? Life Insurance as a Retirement Savings Vehicle – A Good Idea? Year-End 401(k) Matching – A Good Thing?